If you go fishing, our goal is to have a good time, and catching some fish greatly increases our odds of having a good time. Yes, it’s fun to be outside with friends or family and enjoying wildlife and being around the water, but when you go fishing, you really want to catch something. In the summer months, rivers can provide consistent fishing action. Almost wherever you live, there’s a river close by. Most of those rivers will be home to some fish. They could be carp or catfish or smallmouth or walleyes or something else. And, during the summer, much of the time those river fish will be hungry and willing to eat your bait. Here’s how you can convince those fish to eat the lure on the end of your line. River fish like to be near stuff. It could be a rock or a log or a bridge piling or a dock: Just remember that river fish like to be around something. Current is also a very important consideration for fish location. Much of the time fish will be at the edge of the current. Perhaps that’s why they like to be near rocks and logs. They break the current. The fish hold just at the edge of the current. When some sort of food goes by in the current, the fish darts out and eats whatever just went by, then they get back in the slack water out of the current. Lots of baits will catch river fish, but if you’re after bass, walleyes, pike, or panfish, it’s hard to beat a jig tipped with soft bait. An Impulse Swim’N Grub on a Slurp! Jig is about as good as it gets. Use the three inch Swim’N Grub for the bass and walleyes and the two inchers for panfish. When the water has some color, go with a Thumper Jig with the plastic. The Thumper Jig has a spinner that will attract fish better in stained water. Lure presentation is important. Keep in mind that river fish that are interested in eating are usually facing upstream. Fish that are facing downstream are usually going somewhere and maybe not so concerned about getting something to eat. Most of the time, not all the time, but most of the time, you’ll want to present your bait so it’s moving into the fishes face. Usually it works well to cast cross-stream and retrieve the bait so it washes into the suspected fish-holding area. Many rivers are best fished by wading. Some anglers like to slip into waders or a pair of old tennis shoes and walk around in the river. If you’re one of those anglers, keep in mind that it is often most productive to start downstream and work upstream. By doing so, you will be presenting your bait in a downstream manner, and you’ll be less likely to alert the fish to your presence. Also if you’re wading, keep quiet and don’t move quickly. Try to keep a low profile. If you’re on the top of the riverbank the fish can see you easily and will spook. Additionally, be aware that your shadow will scare the fish. As much as possible, stay at river level. Rivers are everywhere, and they can provide an outstanding fishing experience throughout the hottest periods of the year. Find a river near where you live and get on it or in it. I’m guessing that if you do that once, you’ll do it again. 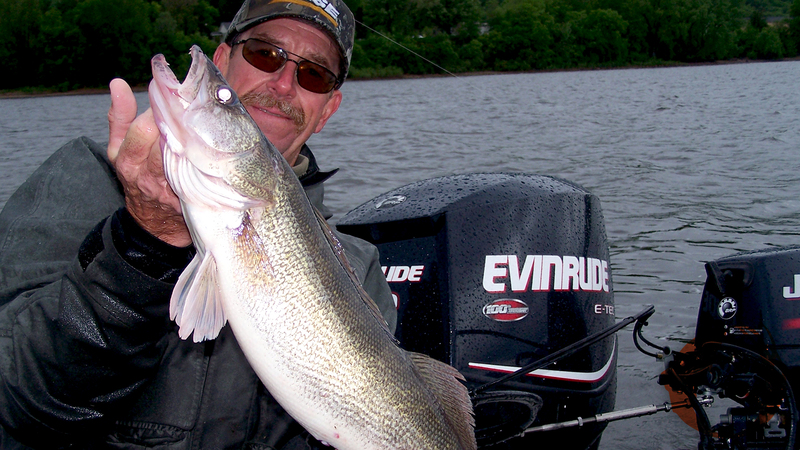 Photo: Our friend Loren Waalkens took this nice walleye on a rainy day on the Mississippi River.